Recently, I’ve been fascinated by a wave of expert articles in various magazines, such as Scientific American Mind, advising me how to release my inner genius – because in my line of work it helps a lot if I can be creative in generating new ideas to get the word out about what’s happening at the Museum. What I have learned is that anything can spark the creative mind – even an email from Saks Fifth Avenue. click each small box to explore different videos. Then, it hit me like a space rocket out of the clear blue sky. Okay, maybe that’s a little too dramatic. But an idea came to mind, and thanks to an amazing team here at the Museum, we made it reality. 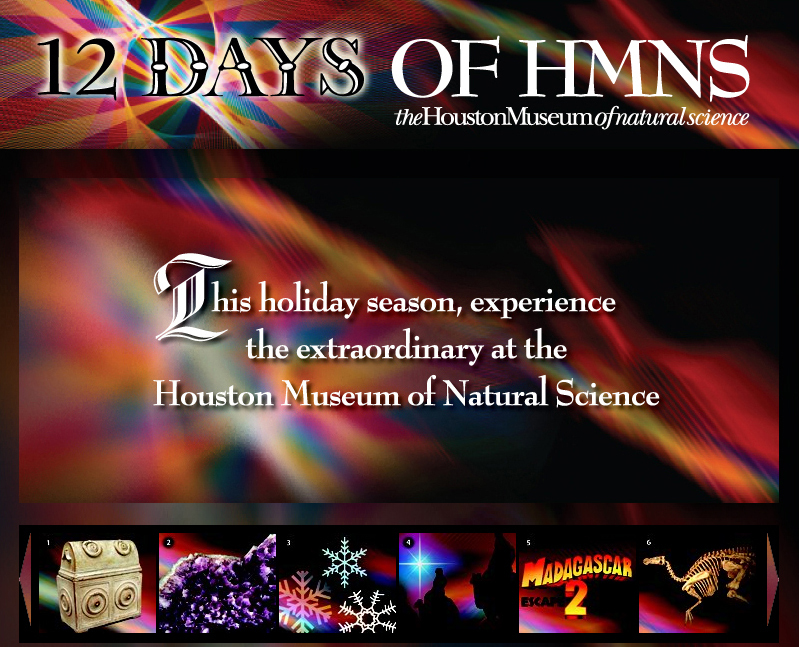 Our new 12 Days of HMNS web site (main page shown above) is designed to give you an inside look at everything in store for you this holiday season at the Houston Museum of Natural Science. Click here to visit the site and access the video. So, we packed up our video camera and explored the museum, visiting every corner – from the underground “Containment Room” where our live insects are raised and the animation studio where our Planetarium shows are created to the most secure corners of the Gem Vault and much more. We had a blast talking to curators, staff and experts from all over the Museum. And we hope you’ll enjoy this rare, behind-the-scene look, from the detailed planning that goes into bringing 80,000 pounds of snow to Houston to how a planetarium show is put together and how we care for our amazing bugs and gorgeous butterflies before putting them on display; as well as the current and upcoming special exhibitions you can see at the Museum this holiday, plus the significance behind them. It took an entire team of people to help us put this special site together and we can’t possibly thank them enough for the time and energy they put into 12 Days of HMNS. After viewing it, let us know what you think – and if you do visit us this holiday season. We hope to see you soon. Happy holidays! Next Post What's white and weighs 80,000 lbs. ?